Uh oh, Christmas is around the corner... you know what that means right? Shopping, wrapping, lists, decorating, planning, cooking, budgeting, school events, work parties, and the list goes on!!!! How can you not have a headache from the rush and the stress? Well, Thermal-Aid can help with their Headache Relief System. Not only is it gonna be a great gift idea but it will be a lifesaver for yourself. Their Headache Relief System uses no pills, has no side effects, and is safe and effective. It was created by a board-certified Nerologist and is clinically proven to relieve tension and migraine headaches. It also helps you relax and fall asleep because it calms the stress and tension that lead to restlessness. I received the Headache Relief System and not only is it easy to use but it works!! You just apply the cream and then put on the mask. The Headache Relief cream is a safe yet powerful topical analgesic pain reliever that you rub into your temples and forehead. It absorbed quickly and didn't irritate my skin. The eye pack is a cold press that blocks light (if you ever had a migraine you'll know how light can feel like a hammer smashing your head.) The eye pack also applied a subtle pressure to my forehead and temple which helped ease the tension. Bio-Engineers and Doctors actually worked with a milling expert to remove the embryo/germ tip cap and outer coat from each kernal of corn inside so that you have a clean and pure product. It holds temperatures for longer periods of time and eliminates mold, fungi, and foul odors. I couldn't believe how well this worked. I actually nipped a migraine in the bud when it first started! 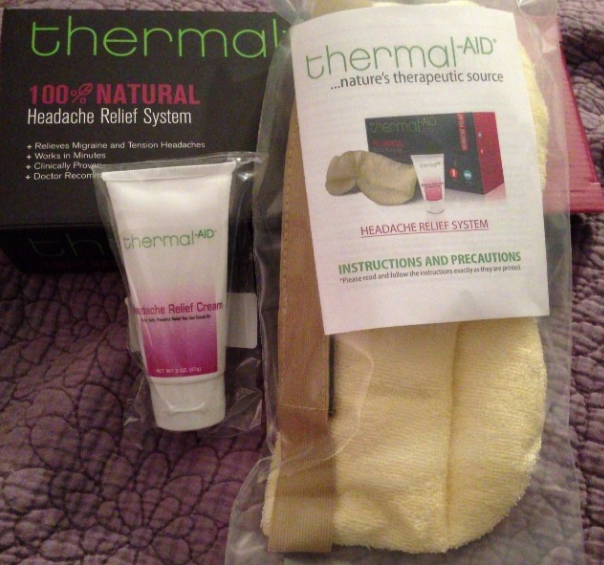 Of all products I've ever use to relieve migraines and tension headaches, the Thermal-Aid Headache Relief System worked quickly, was the most pleasant, and was super convenient! The second I applied the pain cream I knew I was in for a relaxing recovery. The eye mask literally felt like magic. The worst pain is the throbbing of a headache especially when light hits your eyes. This blocked all the light out and applied pressure all while giving me a nice cold (but not too cold) sensation. I was able to nap right away and when I woke up my headache was gone. It's a miracle!!!! My favorite Thermal-Aid is the Tiny Elephant!